Since I’d visited the school garden four weeks ago Autumn had arrived. Today came the first frost. Things are definitely slowing down now and I wanted to get a sense of how things are doing. And to tidy up. I finally removed the bean plants and sweet peas that had been clinging to their frames and dissasembled the bamboo ready to be packed away until next year. I collected some plant debris such as from the old lettuce and shrivelled up squash plants and added it to the compost heap. The calendulas, that had never really shone this year, were still desperately trying to flower, with a few buds waiting in vain to come out. I didn’t have the heart to uproot them and decided to do it another day in the hope that the flower heads that had begun to turn into seed heads would also mature enough for me to save. The radishes that had been planted back in September had not really grown big enough yet to harvest. The chives that had taken so long to mature now looked nice and chunky. I’d like to transplant them soon so that I can overwinter them in order to replant them into next year’s garden. Chard and kale were still growing well and still had lots of life in them. Most of the carrots had already been harvested by the school but there was still the odd plant growing. Quite unexpectedly I also found a couple of carrot plants growing in another bed alongside the squashes. Somehow they’d found their way there, perhaps blown by the wind or inadvertently transported by me when sowing! A happy accident nonetheless! Disappointingly I didn’t find much of the grazing rye that I had scattered in September. Rather than a blanket of rye grass I only found a measly handful of blades. Perhaps it had been too late to sow them? 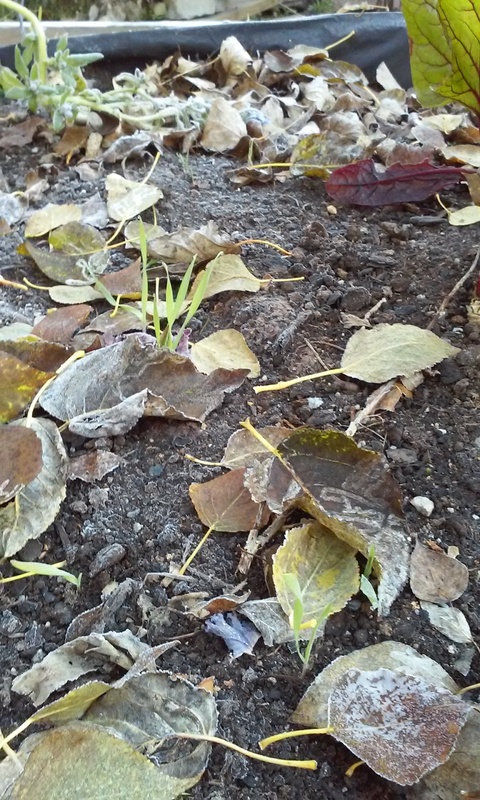 I’ll keep my eyes peeled for any more sprouting up and, in time, I’ll dig in whatever has germinated which, along with the leaves, will add more nutrients into the soil. I’ll be back again in a few weeks to continue with the clear up. Categories: Food growing, Raised beds | Tags: Autumn, frost | Permalink. Wait, what happened??! One minute it’s spring, the next minute it’s…. This morning’s forecast of rain that has turn out to be (surprise!) snow is somewhat head wrecking but it won’t significantly affect my plants. However at this time of year it’s still important to be prepared for unexpected dips in night-time temperatures and frost. When it’s bright and sunny outside, it’s easy to get complacent. This coming week, there are swings of temperatures of between 0 to 11 degrees C, and in the outskirts or higher areas of the city the temperatures drop to -4 degrees C at night. So it’s worth just being vigilant. Protect your most vulnerable plants. I’ve only just managed to save my Sweet William (Dianthus barbatus) so I’ll be watching the temperatures keenly and throw a light fleece over it again if necessary over the next week…. 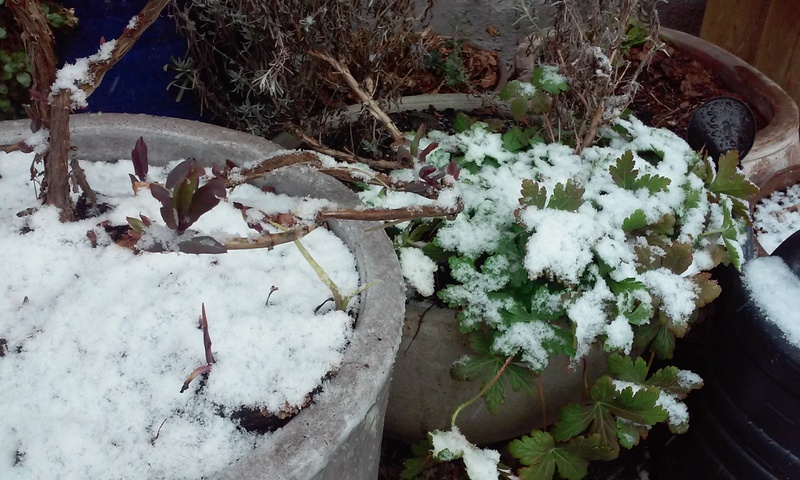 Categories: Gardening in Oslo | Tags: frost, night-time | Permalink.